Kia Motors America (KMA) today unveiled the Ray Plug-in Hybrid concept during a press conference at the 2010 Chicago Auto Show, advancing the momentum of Kia Motors’ global alternative fuel and powertrain research program, and its sub-brand coined “EcoDynamics,” to develop innovative fuel-stretching and emissions-cutting technologies. The most efficient Kia vehicles with significant fuel consumption and emission reductions developed under the EcoDynamics sub-brand will be identified with the EcoDynamics badge. Recently, the EcoDynamics sub-brand took a major step forward with the introduction of the Kia Borrego Fuel Cell Electric Vehicle (FCEV) followed by the Forte LPI Hybrid, the gasoline Kia cee’d Hybrid and the twin-turbo diesel Kia Sorento Hybrid. As the world demands more efficient vehicle designs that combine sophisticated and sleek lines with functionality and fuel economy, the Kia Ray concept is a bold new collaboration between design and engineering. Ray inventively showcases a futuristic four-seat compact sedan based on the Kia Forte platform and demonstrates a prospective plug-in hybrid vehicle configuration from Kia. Designed with light-weight and recycled materials, as well as hexagonal roof-top solar cells embedded in the glass roof panel that power extra lighting or climate control systems, the Kia Ray is the fifth vehicle from the Irvine Calif.-based Kia Design Center America (KDCA) to be revealed in the last year. The latest design from KDCA follows award-winning Kia vehicles Soul, Forte, Forte Koup and the all-new Sorento. The stylish, aerodynamic Ray combines design and engineering for maximum efficiency, incorporating clean, flush surfaces minimizing unnecessary edges, a flowing profile and pronounced rear shoulder ending in a slightly high deck lid for reduced drag, touch-screen controls, drive-by-wire steering, “cool-glazing” solar glass and a lithium-polymer battery – all possible indicators of future technology from Kia Motors. As a plug-in hybrid, Ray is designed to reach driving distances of more than 50 miles (80 kilometers) using its electric motor on a single charge, and has a fuel economy rating of more than 202 miles per gallon (85.9 kilometers per liter), and has a total range of 746 miles (1200 kilometers). 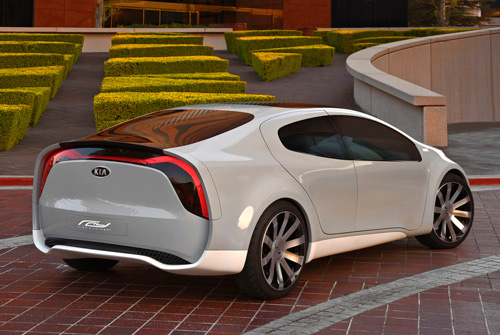 As part of Kia Motors’ EcoDynamics sub-brand, the Ray concept demonstrates a unique vision for eye-catching vehicles with the goal of reducing environmental footprints. Kia models will carry the EcoDynamics badge as they are progressively introduced and are designed to deliver significant environmental benefits. These vehicles also will retain a sporty design, fun-to-drive performance and a strong appeal for the young-at-heart. 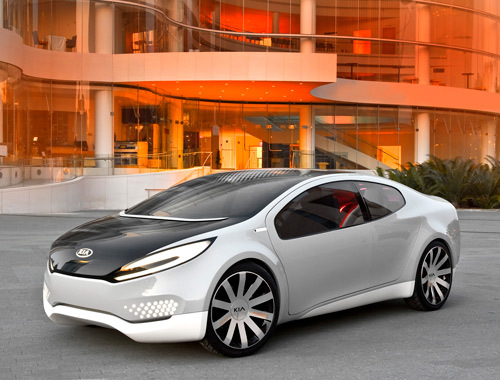 EcoDynamics is the overarching design philosophy applied to make the Kia Ray concept efficiently functional and striking in appearance. A lowered mono-volume shape and a strong, curvaceous silhouette give the Kia Ray concept better aerodynamic properties than taller profile hybrid vehicles. Strong and lightweight materials are used to support the EcoDynamics philosophy starting with a tabbed LED Kia badge covered with a single piece of glass that extends over the hood and another piece of glass that extends from the cowl of the windshield to the rear header to offer occupants a spacious, airy feeling. A lighted bluish white-colored battery charge indicator display is hood-mounted, furthering the Kia Ray concept’s futuristic design. A tapering greenhouse cabin and a longer “tail” improve aerodynamics while reduction of drag is attained through a one-piece, smooth-as-glass, integrated underbody panel, narrow tire width and flush wheel design. Front driving lamps slide back to create openings for better air intake when the gasoline engine is being used and a sliding U-shaped deck-lid extends from the rear of the vehicle at higher speeds for improved coefficient of drag. In lieu of side-view mirrors and door handles, motion-detector cameras are mounted flush with the body for safe lane changing procedures and opening of doors. The result is an airframe on wheels. The front door opening features a forward cutout design for the feet allowing ease of entry. The rear door lines are purposeful with rear-hinged coach doors, yet stylish as their height and shape improves ingress and egress. The Ray employs new “cool car” technology, including nano-laminate films and cool-glazing materials applied to the concept to dramatically reduce solar heat and demonstrate how keeping the interior cool will reduce air conditioning loads and greenhouse emissions. When the vehicle is parked in the sun, the solar cells provide a trickle charge that help operate the cooling fan to reduce interior temperatures. Using the natural element of air as the design focus to convey a pure, refreshing, breathable and lightweight feeling, Ray’s interior is comprised of eco-friendly recycled materials in cool white tones to offer passengers a sense of crispness, while also reflecting the heat of the sun, keeping the temperature down and reducing the need of air conditioner use. Front and rear seats, mounted on side sills, create a floating effect with hollowed out elastomeric materials to support body weight, made of lightweight composite materials. Fresh and sustainable materials like wool flooring unite to create a simple, yet sophisticated, comfortable cabin, with a light-weight touch screen instrument layout featuring touch screen push-button start and gear shift toggle. The center stack features the all-new Kia UVO powered by Microsoft® advanced infotainment system, which provides users with friendly voice- and touch-activated controls for simple management of music files and hands-free mobile phone operations. Adding to the list of green technology features, Ray also employs the all-new GreenEdge™ system by Infinity® Audio, complete with loudspeakers that reduce power consumption and dissipation through lower self-heating temperatures with increased acoustic performance, a better synergy between amplifier, speaker and vehicle. The amplifier used also reduces the idle power consumption by 50 percent of current Infinity speakers and employs a lower dissipation design for significant savings in overall weight. With a focus to reduce overall weight through materials and design, a hexagon/honeycomb shape can be found throughout the cabin, used as a repeated design element while tying the interior theme together. Used also in the door inserts and seats, this lightweight and breathable mesh serves to reduce overall curb weight as well as being a unique design element. Other materials found in the cabin are soft to the touch with a matte finish, including white leather, offering a more luxurious feel while making the interior more inviting and tranquil. The 100 percent earthy mocha wool felt floors add a touch of warmth and are environmentally friendly, coming from a renewable resource. 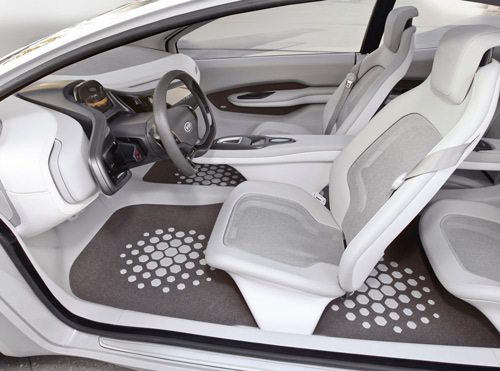 Further to Ray’s green characteristics, the floor mats are incorporated into the design of the floor, greatly reducing the amount of material used. The Ray Concept is designed to be powered by an all-aluminum 153-horsepower Gasoline Direct Injected (GDI) 1.4-liter engine mated to a permanently-engaged fixed ratio Continuously Variable Transmission (CVT), used in combination with a 78kw electric motor. Depending on driving conditions, power is sent to the wheels from the gasoline engine, the electric motor, or both together. The Ray concept is front-wheel drive with a four-wheel independent suspension. Furthering EcoDynamics innovation, the Ray concept’s advanced system is equipped with an engine-power saving alternator management system and a toggle gear-shift up/down indicator to encourage economical driving. Custom-designed low-rolling resistance with a hexagon pattern, narrow 20-inch (195/50R20) tires also improve Ray’s efficiency.